You might think it can’t happen to you, but can you be sure? The work is a non-fiction account and memoir covering the communication between herself and the scammer, based on her records of their communications. By sharing the personal and intimate nature of the interactions it asks the reader to put themselves in her shoes, and in response, the question “how could you be so stupid?” is answered. It details the process of dealing emotionally with the scam and the financial difficulties that she found herself in afterwards. It is a story of her process through being a victim to becoming a survivor. Areas that need change are also addressed. Some support resources and links are also provided, though this is not the main purpose. Dr Cassandra Cross, Cyber Frauds, Scams and their Victims. I applaud and respect your honesty – it must have been extraordinarily challenging to relive the experience, and I salute you for it. It’s a high emotional impact book. 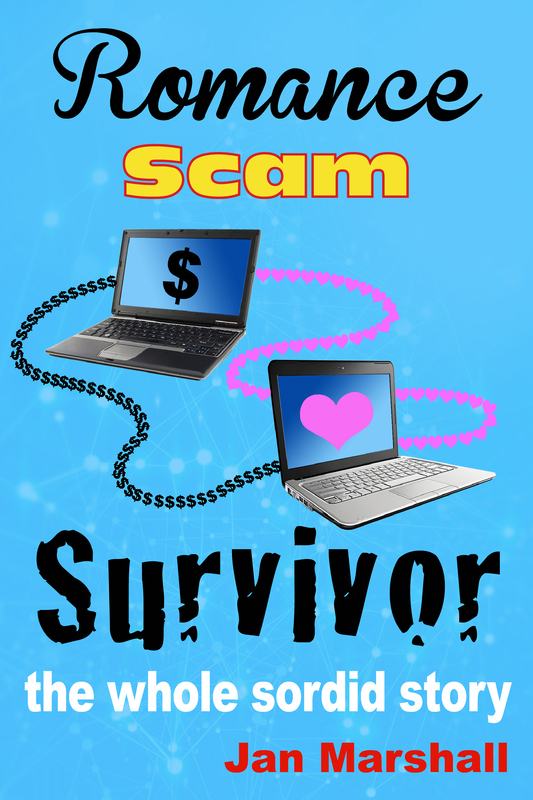 I began reading Romance Scam Survivor: the whole sordid story and have been compelled to continue. My heart is breaking for you as I am amazed by your strength. This is more than a memoir. It has great honesty and openness and contains much useful research and advice. ★★★★★ "I liked “Romance Scam Survivor: the whole sordid story” by Jan Marshall which I felt was a very bold account of her dealings with a scammer. Women can learn from her book. It’s well written, fast moving and very interesting about the people in this world who put on a good show with nothing behind it but deceit. I admire the author for writing this book." I read your book in (almost) a single sitting…….had to go to work in midst of it. AMAZING! Your honesty, vulnerability, determination and persistence are extraordinary. I think you are astonishing making such a leap forward from this truly awful challenging event. I found it riveting from the start, I’m sure I won’t be the only one. I’ve also just finished Jan’s book. Amazing and so powerful, I echo all of Rosie’s words. For me it also helped to hear more of the details that you couldn’t share with us at the time. I was feeling such sadness and anger as well as feeling so much admiration and power as you emerged as Survivor. I knew that we were doing our best to support you at the time yet we had no way of knowing what it was really like for you. Reading about the work we all did together on that post-legal letter to the ATO and how this was part of your recovery process was deeply touching. And the amount of research you did- wow! This book is a great contribution and over time it’s clear that the system has started to catch up. All the Media work you did is also a big part of this shift and I hope through publishing this book you will be even more widely acknowledged.